Can I Grow Water Kefir Grains From Scratch? Tibicos, or sugary water grains, can not be grown from scratch. They are made up of a group of bacteria and yeast that exist together, without one overwhelming the other. These bacteria form a polysaccharide (complex sugar) that make the actual crystal. You have to actually get the culture (grains) from someone else who has them. The true origin of water kefir grains is not known. There is a certain cactus in Mexico where hard bits form on the leaves, and folk lore has it that these bits will form into kefir grains, but for some reason this isn't a known fact. Mostly you will just find speculation about where these little guys came from. You can order water kefir grains from us if you live in Canada or the United States. Once you have the grains, if you follow the basic water kefir recipe the grains you have will start to grow. Before you know it you will have more water kefir crystals than you know what to do with! 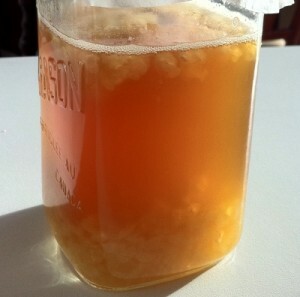 What If My Water Kefir Grains Are Not Growing? Occasionally you will get a batch of grains that don't grow. This does not necessarily mean that there is something wrong with the kefir you are making. If the brew smells and tastes fine, go ahead and drink it. Kefir grains do like specific conditions in order to really thrive and be happy. The first step is to follow the instructions for making water kefir. This is the recipe I have found my particular strain of water kefir grains like the very best. My crystals double in size every 48 hours, so does it not make sense to follow a recipe that is proven to work? You would be surprised how many people claim they are following the recipe, but when I talk to them it turns out they reduced the sugar because they thought it would be healthier, or left out the piece of lemon because they "did not want to have fruit" in their drink. Seriously, 995 of failed kefir is recipe related! Avoid heat. Kefir grains are made of bacteria and yeast, and bacteria and yeast are killed or damaged by heat. So make sure that boiled water is cooled to room temperature before using. You may not think that a short exposure will kill anything. You have proobably heard that you have to boil something for several minutes to sterilize something. This is true, however you do not need to kill all the bacteria to ruin a batch of kefir. Just slowing down a few of the strains with water that is too hot can disturb the balance, allowing one bacteria to overtake the culture. Cross contamination can be another issue. If you culture more than one food, i.e. sour dough starter and water kefir, make sure they are separated by a couple of feet distance, and use different utensils. What Should Kefir Look Like? Follow these simple tips and you will be well on your way to growing healthy kefir grains. Hi, I have been making Kefir for a long time now, and I go through a stage of not producing bubbles, I don’t know if to start over again . The seeds keep doubling and looks healthy, it tastes fine, does it have the same affect flat as it does with bubbles. I use filter tank water and Rapadura sugar and fresh apples or pineapple or dried cranberries, so please what am I doing wrong? Hi Kris Thanks for the message. Kefir goes through different stages, It is often because of the slightest changes. I find mine are affected by the change in seasons, reflecting a change in house temperature and humidity! As along as everything else is as it should be, then there is nothing wrong. you may want to try putting a tightly sealed cover on it after 24 hours to see if you can increase the bubbles, but CHECK IT every few hours. The gases can build up and explode the bottle if left too long! Previous Previous post: What Should Kefir Look Like? Next Next post: Can Kefir Make You Sick?